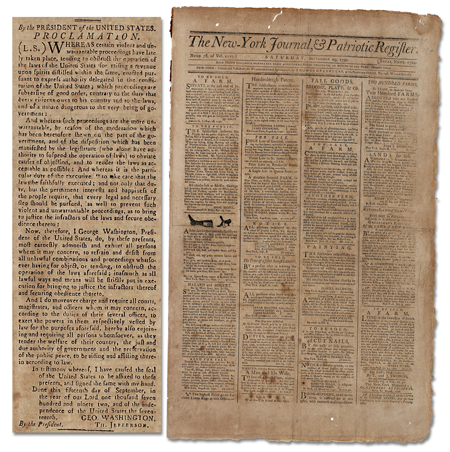 I am very pleased to announce that in a special evening sale on November 14, Christie’s will be auctioning George Washington’s First Presidential Thanksgiving Proclamation. 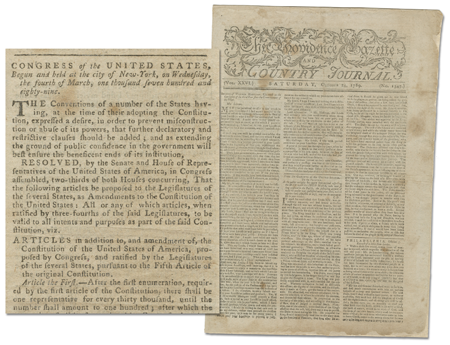 In one of the final acts of the historic first session of the first Federal Congress sitting in New York, Congress had requested that the president issue such a proclamation. On September 28, 1789, the day Congress passed the Thanksgiving Proclamation resolution, the proposed Bill of Rights passed its final Congressional hurdle. Two days later, Washington sent copies of the Bill of Rights to the states for ratification, and the next day issued this Proclamation. We’ll post a link on our website to the catalog (with an introductory essay by Richard Brookhiser) as soon as it becomes available. Though I more frequently represent buyers, in this case I represent the seller. If you would like additional information, please don’t hesitate to contact me. This historic act of Congress was the lynchpin of Alexander Hamilton’s audacious plan to place the government on solid financial ground by taking on more debt. 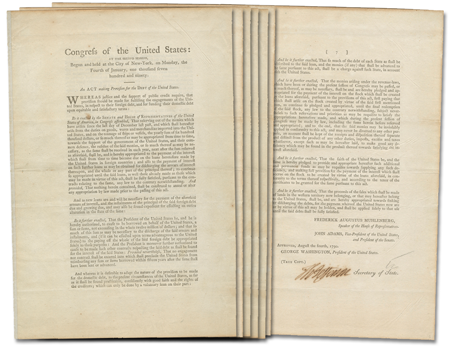 The document we are offering is an official copy—only two of which were prepared for each state and signed by Thomas Jefferson—of the first of four Acts implementing Hamilton’s plan. In a compromise brokered by James Madison, Jefferson agreed to accept the plan that he hated in return for Federalists agreeing to move the nation’s capital to the South. [UNITED STATES CONGRESS]. THOMAS JEFFERSON. Document Signed as Secretary of State. 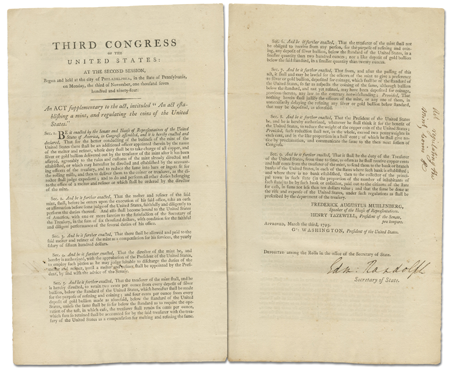 An Act making Provision for the Debt of the United States. 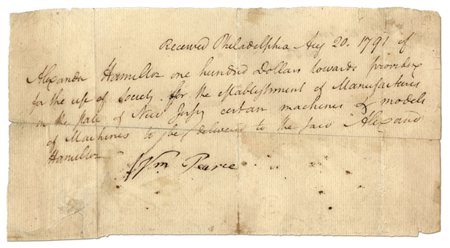 August 4, 1790. 8 pp. After months of wrangling, Congress approved 12 proposed amendments to the Constitution. Rhode Island was the only state not to send a representative to the Constitutional Convention, and did not ratify the Constitution until May 1790. The most unpopular part of Hamilton’s assumption plan was an excise tax on whiskey, prompting farmers in western Pennsylvania to take up arms in protest. This 1795 addition to the Mint Act (1792) establishes a new position of “melter and refiner,” charged with receiving bullion and processing it into bars or ingots. Finally, this Thanksgiving, November 28, is also the first night of Hanukkah. This hasn’t happened before, and won’t happen again for 77,799 years. I had to share this unique moment of serendipity in closing.